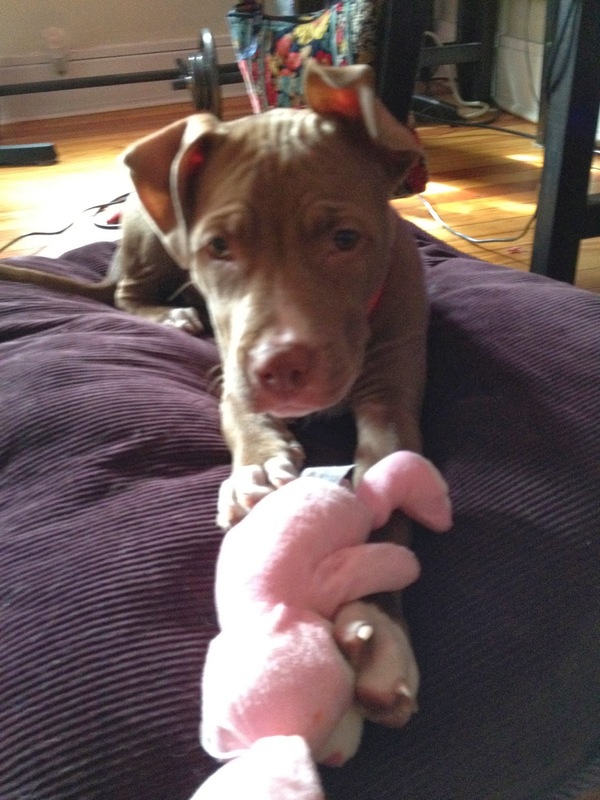 I just learned that today is National Pit Bull Awareness Day and that October is National Pit Bull Awareness month. I am so glad that these under appreciated and totally misunderstood pups are getting some national coverage for being fantastic family dogs!! A number of years back, my best friend had a pit bull named Bowie and this dog was the exact opposite of what I'd heard about pit bulls. I mean, c'mon, I literally spooned with this dog when the Baconator and I visited Harlem. 3 people and a dog in a full-sized bed made for tight quarters, but this dog was the best. It was during this one little weekend that pit bulls started sneaking up the potential breed list for me. Leia's first day with us! She is nothing like the growling, snarling, angry, biting, terrible and terrifying dog that is on the news, and let's be real, most real life pit bulls aren't. Take for example, Miss M and Mr. B in the amazing blog, Two Pitties in the City - they are stand up citizens here in Chicago that are just fabulous dogs, I'd even put them in the column of "rolepups" for Leia. They are well mannered, sweet, obedient PIT BULLS that are happy to wear doggy goggles and trek around town meeting people. Of course, much of their great training comes from their really wonderful owners, but the owners aren't master trainers with their own video series. Nope, they are regular people that love their dogs and decided to tell their story online. 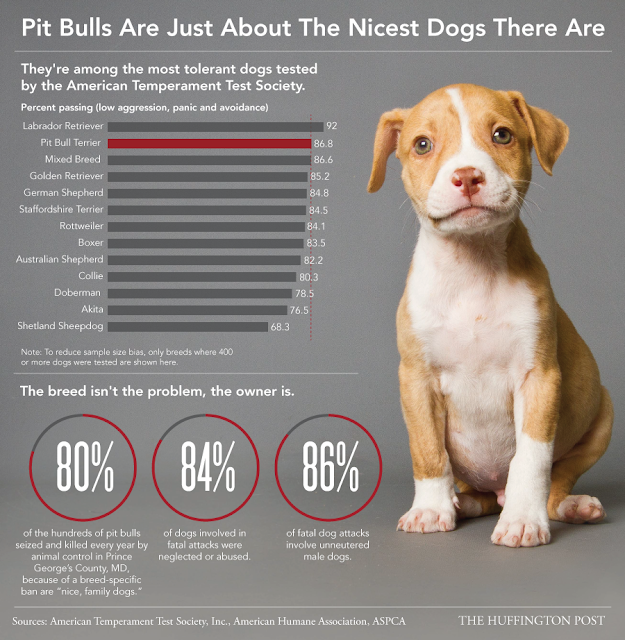 I'd highly suggest checking out their blog if you are a pit lover or a pit skeptic. I love the infograph that Huffington Post shared earlier this month. I think it really encapsulates what we've been trying to tell the world: Pit bulls are great dogs and they deserve the opportunity to become family dogs. So this month, tell someone about the pit bull breed, and remind them that breed specific legislation is unfair, unjust and kills thousands of dogs every year, just for being born. Great post, and great way to spread the word! I didn't know anything about pit bull-type dogs and I really did believe the media until I met a pit bull for the first time myself and I realized how wrong they were. Thanks so much for the mention (they really are just regular pups who love going on adventures and meeting people) and I know Leia does so much too. How cute are those ears!